Be prepared to be bewitched, enchanted and mystified as our Kids Party Magicians in Brisbane cast a spell over your special event with their feats of illusion and tantalising tricks. Your child’s little guests will be gobsmacked by the mind boggling magic show and other party activities such as balloon twisting, games, face painting, a treasure hunt and a whole lot more! 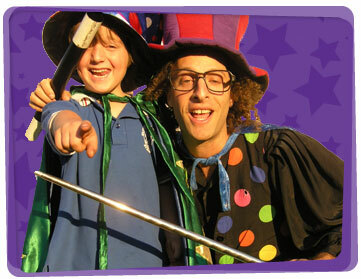 As an optional extra your magician can hand out a wand to every participant so they partake in the magic spells. They make great take home prizes and look wonderful in group party photo shots. Ask the Yabadoo sales team how to order. 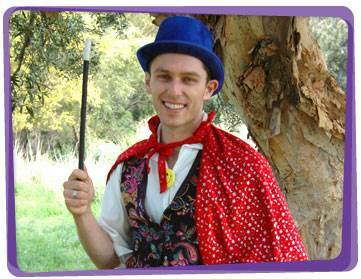 Our magician for hire in Brisbane can be booked for kids parties, shopping centres, vacation centres, corporate events and birthday parties to name a few. Do you need a magician party game idea for the kids to play? Divide the children into two teams and have them stand in line. 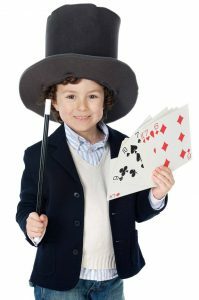 Put a top hat a few meters away from each team, and give every child an equal number of playing cards. The players take turns in trying to toss the cards into the hat of their team. After the first player finishes up all his cards, he runs at the back of the line to give way to the next player, and so on. The team with the most cards in their top hat wins. For older children, you can put the top hat further away from the team to increase the difficulty level.